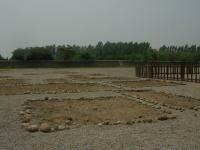 Yin Xu is an archaeological site containing the remains of Yin, the last capital of China's Shang Dynasty (1766 BC - 1050 BC). It represents the golden age of early Chinese culture, crafts and sciences in a time of great prosperity. Yinxu is also famous for the discovery of 'oracle bones', inscriptions on animal bones and tortoise shells which are thought to be the beginnings of Chinese characters and writing. They bear invaluable testimony to the development of one of the world's oldest writing systems, ancient beliefs and social systems. The Yin Ruins are spread out over two separate locations: the Royal Palace area and the Royal Cemetery. Arriving at the gate of the Royal Palace area, I hadn't the faintest idea what to expect about this site. But when I saw the gate I immediately felt that this would be a visit to remember. That gate itself is already striking, and prepares you for the shapes that you'll see over and over. Behind the gate lies a park with several exhibitions and a museum. Starting at the museum is a good idea because it tells the story of the people of Yin. That they did practice animal and human sacrificing on a large scale becomes clear immediately. There are many fine bronze objects on display and of course the bones with writing (oracle bones). At first sight they look just like normal bones, you have to look up really close to see the inscriptions. Amazing! The general feel of the site is brand new and bright, with a lot of attention put into its layout and detailing. There are explanation boards everywhere in English. One of the highlights in the Royal Palace area is the 'Oracle bones inscriptions stele gallery'. Here translations from writings on oracle bones into Modern Chinese and English are displayed. What did they write about? Sacrificing, tribute-paying, military actions and astronomy were popular themes. Remarks on good weather and therefore good harvests are also common. Around the corner the characters of the oracle bones script are compared to those in Modern Chinese. Also very well done. You can see the evolution of the script and the striking similarities. The words in the oracle bones script (being pictorial) are fun to decipher: 'elephant', 'fish' and 'silk worm' are easy to guess. 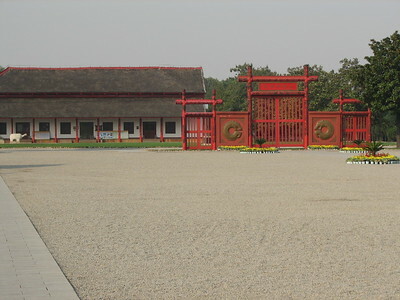 The visit of the main site ends at Fu Hao's Tomb. Fu Hao was a member of the Royal Family of the Shang Dynasty and China's first woman general. Many bronze, jade and bone objects were found in her grave, which has been restored. A golf cart-like wagon covers the distance of 5.5 kilometer to the second location, that of the Royal Cemetery. The trip is included in the 61 Y entrance fee. It's a nice ride through Anyang's suburbs and into Henan's farm lands. It is here that the large Simuwu vessel was found, the largest bronze vessel unearthened at Yin Xu. The Royal Cemetery has a number of restored tombs with displays. The items that are shown are mostly replicas, the originals can be found in the central museum or in various museums around the world. Yin Xu turned out to be the most quiet site that I've visited so far in China. I even was the only visitor at the Royal Cemetery! From Beijing, it takes 6 hours by train to Anyang - the northernmost city of Henan Province. The trip can be cut short into 3 hours if one takes the fast train or dongche. To get to Yin Xu from the railway station, one can take bus 28 to Jian Hang (Construction Bank of China) and switch to bus 18 to Yin Xu Park (Yin Xu Bowuyuan). This is an amazing site for those studying Chinese language - particularly Chinese characters. I have always been fascinated by how they have evolved and seeing the oracle bones museum in the Ancestral Shrines area was such an unforgettable experience for me. Famous suicides: King Zhou of the Shang Dynasty of ancient China. Another ruler who killed himself as his kingdom was being taken over. He burnt himself along with his palace. Human Sacrifice: "Five of the pits contained the remains of a human sacrifice (four adult males and one child)." Former Largest Cities: Around 1300 B.C.